This is a case that demonstrates how we harnessed the power of data to drive communication strategy for the Spotify brand in Canada, and in doing so exceeded all business and communication objectives. Spotify was the world’s number-one music streaming service, but because it was late to market in Canada it had to compete against already established players. Although these players had a strong following, none were truly dominating the category, largely because they were communicating only the functional benefits of their music streaming software. There was an opportunity for Spotify to leverage the powerful connection that consumers have with the music they listen to and its role in their everyday lives. Spotify created a bespoke campaign for Canada, built entirely around real-time streaming data of specific neighbourhoods, tapping into insights that only Spotify could uncover about Canadian music listening habits. Each media placement was strategically selected to match the creative, and each playlist was curated specifically for that neighbourhood. The hyper-local precision was what made this campaign so unique and impactful. 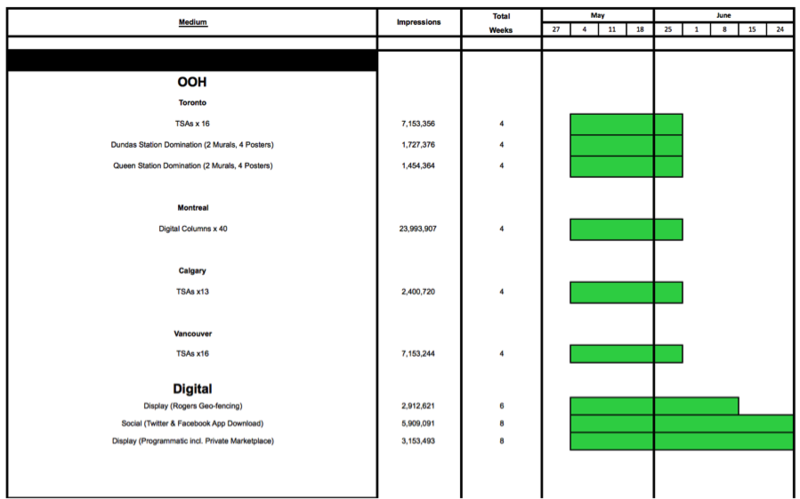 In close collaboration, the creative and media agencies strategically selected each channel, placement, playlist, and execution to make a $250K campaign feel like a $1M campaign. In late 2014, Spotify, the world’s number one music streaming service, was planning its much-anticipated Canadian launch. However, Spotify knew its success in other markets would not guarantee a successful launch in the Canadian market. While music lovers and early adopters might have been anticipating the launch, research indicated that most Canadians were unfamiliar with the music streaming category altogether, let alone the Spotify brand. And among those most likely to use a music streaming service, there were already established competitors like Songza, Rdio, and SoundCloud, many of which had been in the Canadian market for a number of years but none were truly dominating the market. This was attributed to the fact that all of the competitors were communicating largely on feature-led, functional benefits devoid of any meaningful context. Typical feature-led messaging included depth of catalogue, custom radio, free trials, moment-inspired content (working out, partying, etc. ), discovering new artists, etc. Ultimately, our objectives were to drive traffic to Spotify and acquire new users by introducing Spotify and driving curiosity among the Canadian public. 1. Increase brand awareness by 10%. 2. Generate 16MM impressions nationally (digital only). 3. Increase our NPS (Net Promoter Score) by 10 points (from 15 to 25). 4. Achieve Top 10 status (within Spotify) for at least one playlist from the campaign (an internal success metric for Spotify). 2. Move from number five to number one i.n App Store downloads (among music streaming apps). In focus groups nationwide, the brand had conversations with consumers about music: the role it plays in their lives, and when they turn to it. One insight stood out: for them, music was transformative no matter the situation. It had the ability to change their experience of the world around them, to push them forward, or help them focus, help them tune out or feel better. Spotify used real-time user data and influencer input to curate playlists tailored to the listening behaviour in Canada’s highest streaming neighbourhoods. Spotify invited music fans to access “Music for your world”, a campaign customized for a Canadian audience based on where they lived. The challenge with bringing this insight to life would be to avoid falling into vignette after vignette of smiling people dancing and singing to their favourite songs. We had to develop something meaningful, something that would resonate with our Canadian target. Music is most powerful in everyday moments. For Canadians, it wasn’t about the size of the catalogues, the technology, or even the artist – it was about having the music they wanted at their disposal in the moments they wanted it most. We knew the communication would be noticed. With a striking visual style combined with contextually relevant subject matter, the executions would punch above their weight in terms of breakthrough with the target. We also anticipated that, because of the campaign mechanics behind the campaign, those who took the step of sampling the playlist would have a peerless experience of one of the best music streaming platforms. And based on these two certainties, we anticipated that we’d not only successfully introduce Spotify to the Canadian audience but make it locally relevant as well. Spotify was promising “Music for Your World” so we had to know this “world” inside and out or risk coming off as inauthentic and out of touch with our target. We carried out extensive research in each target city to find local insights and each piece of creative was crafted to these local insights (neighbourhood, experience, landmark) with a corresponding moment (commuting, relaxing, partying) to ensure contextual and behavioural relevance. This was then combined with meticulously prepared Spotify music data and influencer input to create playlists tailored to Canada’s highest streaming neighbourhoods. We used this information to map our targets’ listening habits, tracing them back to their daily routines and pairing these findings with our hyper local insights (beyond just music) to create a campaign that held a mirror up to their lives. The result was the creation of 30+ playlists curated to match iconic Canadian neighbourhoods and based upon the actual music most listened to by the people who live there, including both the most streamed and most distinctive tracks (“distinctive” being tracks regularly listened to in those locations only). The playlists were then placed in the relevant context to drive listeners to tap into the soundtrack of their neighbourhood. From playlist to placement, every element of the campaign was driven by real-time data. Combining real-time user data with a strong local insight was key to the out-of-home elements of this campaign. Some examples are riding the 504 streetcar in Toronto, sitting in traffic on the Lions Gate Bridge in Vancouver, and drinking Caesars in Calgary. Each playlist was curated specifically for that location and was a direct reflection of the neighbourhood’s listening habits. In the digital space, all efforts turned towards contextual, use-case-based messaging developed against six editorial themes: Urban Life, Commuting, Eating and Entertaining, Student Life, Health and Fitness, and Fashion and Shopping. These themes were identified based on the top streaming use cases for our target. Over 30 pieces of creative were developed for deployment across sites that fit within each theme. For example, if we appeared on a fitness site, the messaging shown would be relevant to that use case. Mobile ad units and app cards used tactical “listen free” messaging focused entirely on acquisition to complement the rest of the campaign. To further add to the local feel of our campaign, we reached out to key music influencers in each market. These influencers were asked to add to their neighbourhood’s (or city’s) playlist and then promote that playlist through their networks. It was a campaign that celebrated Canadian neighbourhoods through music, while showcasing Spotify as being more than just a streaming service, providing music to soundtrack almost any aspect of your world. Taking a Canadian approach to a global brand paid off across all success metrics. Throughout its two months in-market, the Music for Your World campaign put Spotify in a league of its own relative to its competitive set. 1. OBJECTIVE: Increase brand awareness by 10%. 2.OBJECTIVE: Generate 16MM impressions nationally. EXCEEDED: Because of ongoing optimization throughout the program, we were able to deliver 30,245,753 impressions overall. 3. OBJECTIVE: Increase our NPS (Net Promoter Score) by 10 points (from 15 to 25). 4. OBJECTIVE: Achieve top 10 status (within Spotify) for at least one playlist from the campaign (an internal success metric for Spotify). 2. OBJECTIVE: Move from number three to number one in App Store downloads (among music streaming apps). As this was the first true brand campaign for Spotify in Canada, we can confidently say that there was a very strong correlation between the advertising and the results. When we set out to launch a global brand with a Canadian spin, we could not have anticipated the response. Within days of launch, there was an almost immediate spike in activity across all our custom playlists. In fact, “Canada’s Playlist” (one of our custom campaign playlists) rose to be the second most streamed playlist on Spotify by the end of the campaign, and overall streaming in Canada (on Spotify) increased by 71% versus the previous period. Results showed the campaign had a direct impact on the desired objectives and were not impacted by previous momentum. No change. Spotify had been available in Canada prior to the launch of the campaign.